Pink Milk: Happy New Year! Thank you for all your kindness and support throughout 2011. This little place we call Blogland is a total joy and a huge source of inspiration. My own life would be far less colourful without it. Here's wishing you all a year full to the brim of happiness and creativity. I've cracked open a brand new folder and called it 'Blog Photos 2012'. 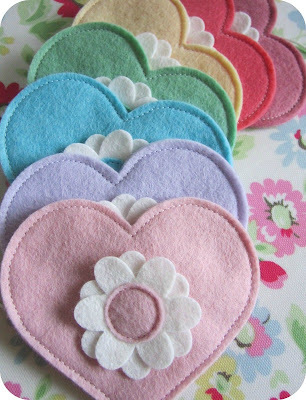 Love those little hearts in such pretty colours, Heather! Wishing you and your family a very Happy New Year!! Only just discovered your blog so really looking forward to seeing what apppears in that folder! Love those hearts Heather. Wishing you the happiest of new years . Happy New Year......i heart your bloggy. Happy New Year to you! I hope the next twelve months bring very good things indeed! How exciting to start them with a brand new laptop. 3) WISH I'd used my latest post to publically declare that noone in my house/wider family will EVER beat me at Bop It. I'd take you on at Articulate if you lived closer! 4) Hope that 2012 is a little easier on you and your family. Love those pretty hearts, very sweet! !